The gift certificate will be received in their email box and they can shop when they would like to do so. Shopping is easy... they make their selection in the cart and enter the certificate code they were provided in their email during the checkout process. The minimum amount of the gift certificate is $25.00. Read more information under the form below. After you fill in the form below the checkout page will automatically take you to PayPal for payment. Sorry, no checks or money orders accepted for gift certificates. Step 1: Fill in the information in the form above and click on the submit button. You will be taken to the cart's checkout page to complete your transaction. Please provide your recipient's contact email address in "Receipient Email Address" field and include your own contact information (as the buyer of this gift certificate) in the cart as you check out. You may also add a personal message to the recipient. Step 3: After receiving the gift certificate, your recipient can shop at DebbysTouch.com to find something she/he is guaranteed to love! 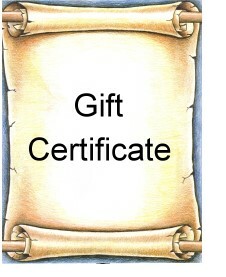 Gift Certificates are redeemable only towards the purchase of merchandise at DebbysTouch.com.